The whole experience of this costume was really interesting for me. 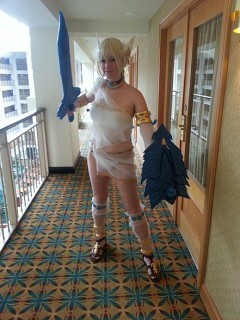 I love cosplaying Soul Calibur characters, and my Sophitia costume from IV was so much fun, so I thought Elysium would be a cool throwback costume. I love the Valkyrie style of the costume and that I could reuse pieces from Sophitia :p. She's such a beautiful, strong character. Too bad they designed her to be a mimic character. I know my body shape is not the best for this costume, but I did not want it to stop me from cosplaying her. I did lose a few pounds from dieting and exercising for her though :). I was still a bit uncomfortable walking around as her, and probably wouldn't do it again until i tone my stomach/love handles. The costume only took a month to make on and off. It was pretty simple. I made patterns for everything except the underwear (didnt want to chance it). All the armor is made from craft foam and styrene. The wings clip on to the wig. The weapons are made from yoga mats, craft foam, and a yard stick. I used a lot of clear strapping to reinforce the bra and underwear.